Pads that look totally innocent, yet will force the name of a destination and astound your spectator! 100% ready to perform instantly! Why worry about filling in your favorite SvenPadÂ® for your next gig? 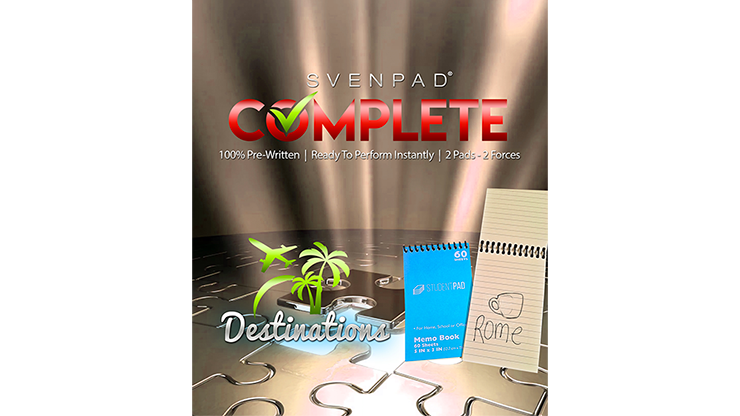 NEW SvenPadÂ® Complete arrives 100% filled in and 100% performance ready, with handwritten pages that do not look printed! Each lined page looks like you wrote it - absolutely perfect! There is nothing else like SvenPadÂ® Complete in terms of out-of-the-box, ready-to-go forces in the most innocent possible memo pad that you could fit into your back pocket. Made with our usual SvenPadÂ® quality, each hand checked, cut to 1/32". Includes TWO of our world-famous SvenPadsÂ®, with TWO different powerful forcing movie possibilities (Rome and Hawaii). The covers of these pads are secretly coded on the front, so the performer instantly knows which force is inside. Both pads look identical and have the same non-force movies inside. The movies chosen are ideal for powerful and fun revelations of scenes from the movies that everyone knows! Made in the USA quality that top performers worldwide trust. SvenPadÂ® remain the #1 precision forcing pads in the world. Your perfect force has never been easier - discover SvenPadÂ® Complete and get ready to perform instantly and powerfully.